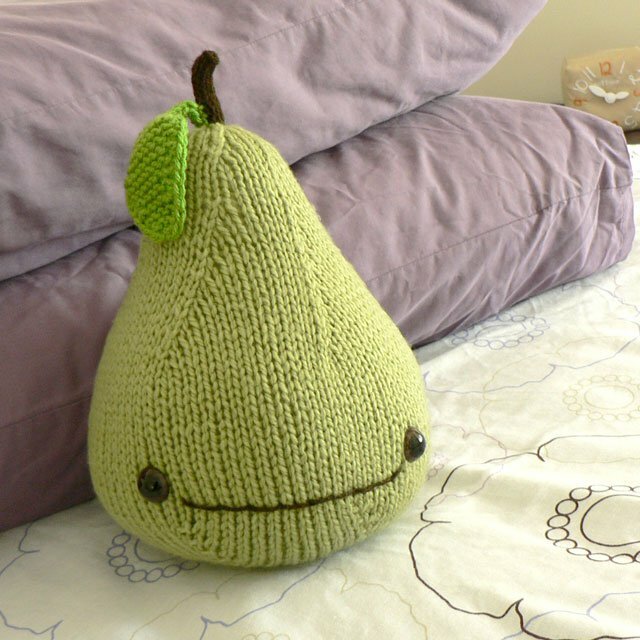 I can’t think of a better way to celebrate the first day of Spring other than to give away an Amigurumi Pear! 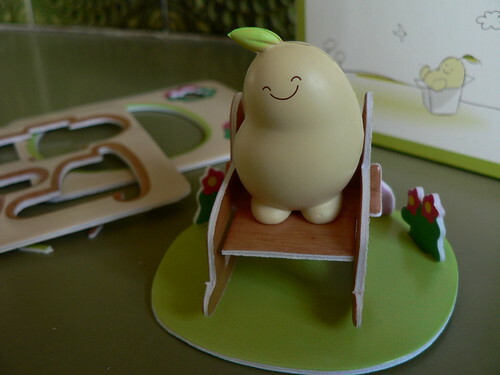 The winner of the giveaway is Amanda of Sasikirana Handmade! Congratulations! I will be in touch shortly. 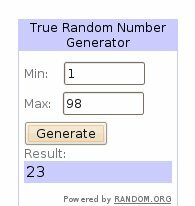 I would also like to thank everyone for entering the giveaway. I had an overwhelming response and it really blew me away! 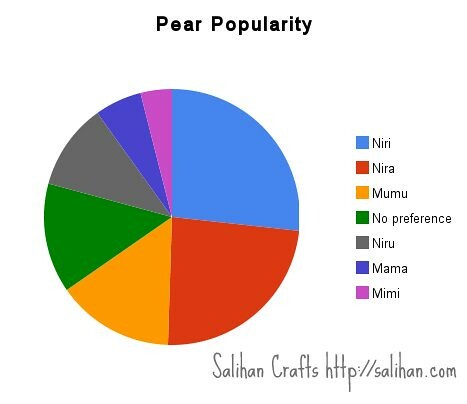 With all the requests for the various pears, I can tell you now that the most popular pear is the Little Niri Pear. 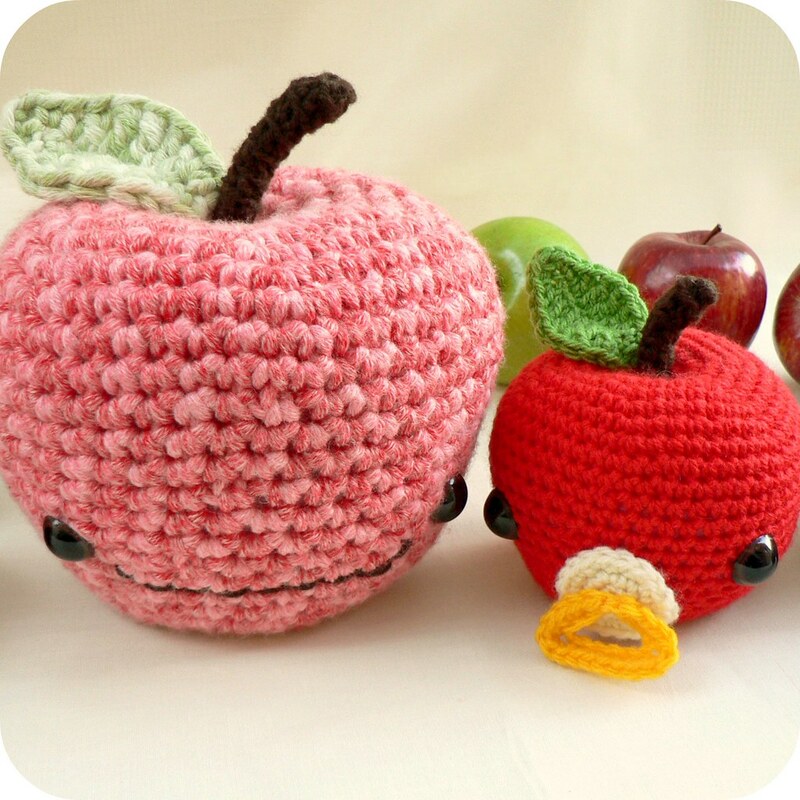 I would also urge you to visit my two big supporters of the Amigurumi Pears. 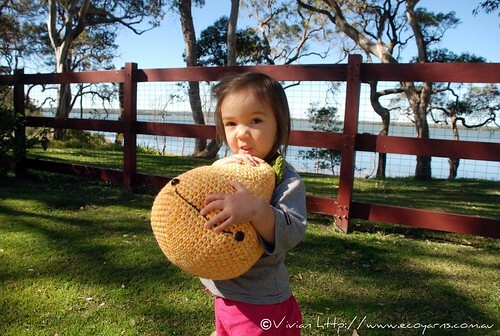 Firstly, Melissa Goodsell of One Crafty Mumma, you totally rock! 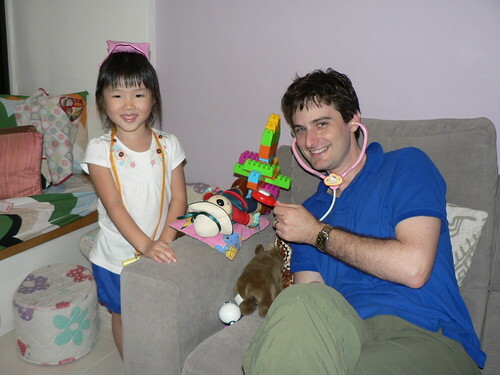 I know many of you have visited my site for the first time through her gorgeous blog. 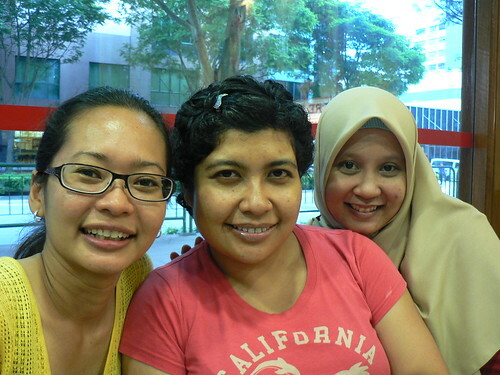 For those who have not heard of her, do visit her blog. 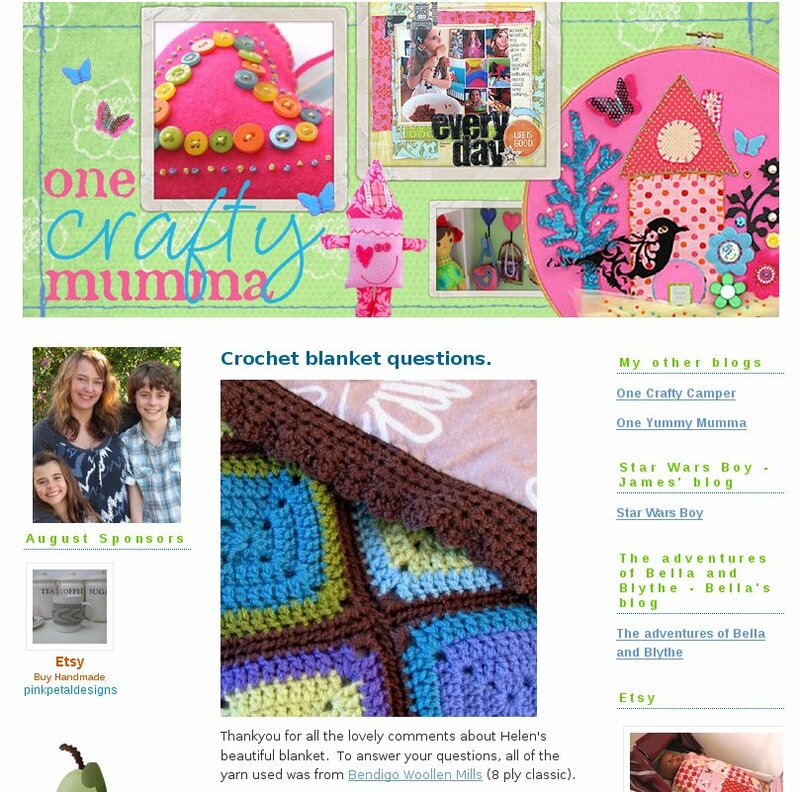 She is famous in the scrapbooking and sewing world here in Australia. 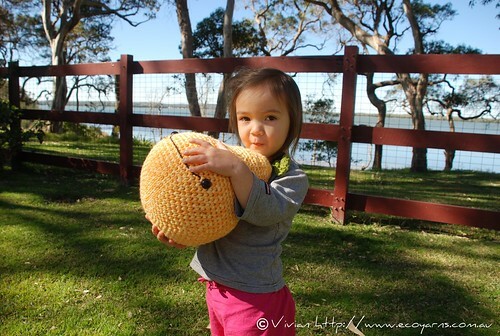 And I think she’s becoming a rather good crocheter too! 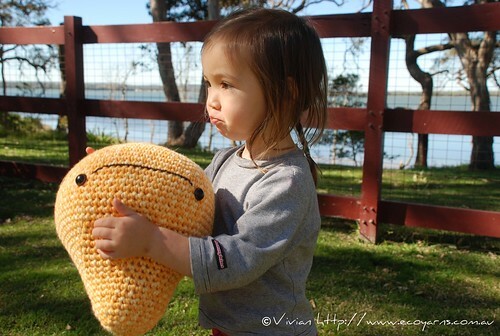 My other big supporter is Vivian of Ecoyarns. 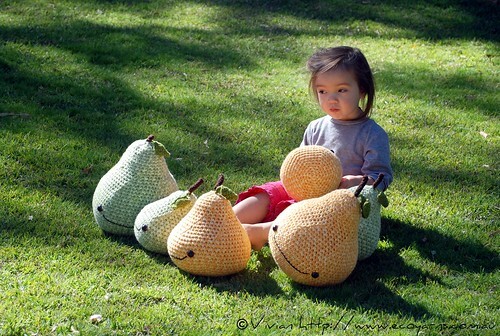 Her daughter, Ysoline, was just so patient during the Amigurumi Pears photoshoot. Wasn’t she just precious? 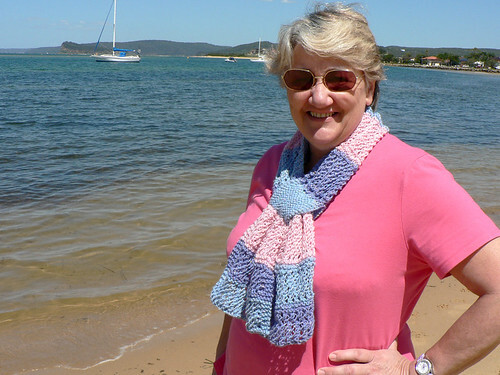 Vivian runs a very successful online shop dedicated to organic and eco-friendly yarns, fibres and fabrics. 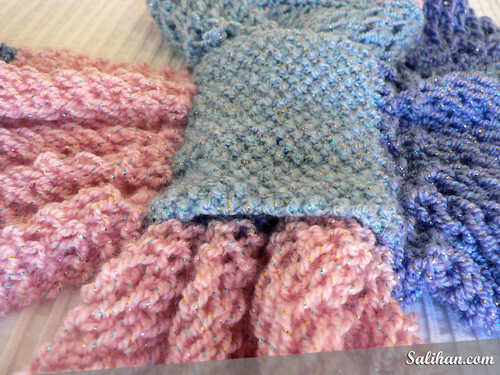 And Ecoyarns will also be sponsoring my next giveaway! I’ll tell you more about it in my next post. If you don’t want to miss it, get automatic updates from me via email or RSS. 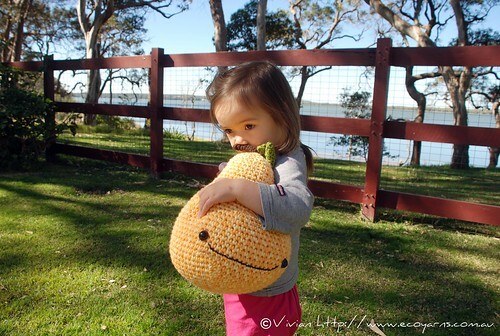 Vivian of Ecoyarns lent me her gorgeous daughter, Ysoline, for a photo shoot with my Amigurumi Pears. I got all set up in Viv’s backyard and started taking a few photos. 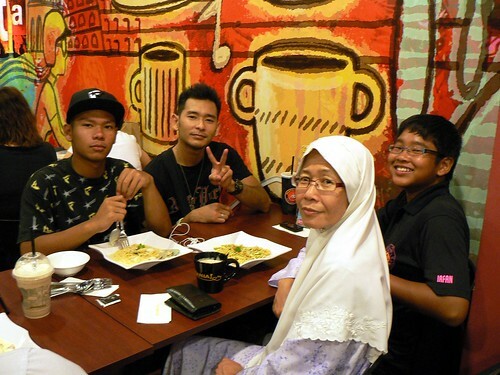 BUT I’m not a mother so I didn’t really know how to communicate with kids that young. Viv captured me trying to coax her to cuddle the pears and maybeeee smile for the camera. But all she did was stare back at me with the pears around her. I didn’t get any decent shot of her on my camera. Just look at Ysoline looking at me! 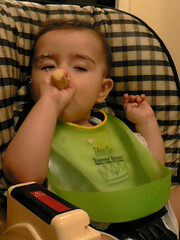 Her mummy, on the hand, was very clever and came prepared. 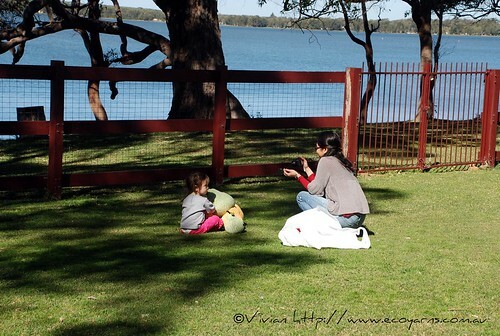 She not only have her camera with her, she had a pocket full of lollies! Vivian offered her a marshmallow and Ysoline instantly came alive. 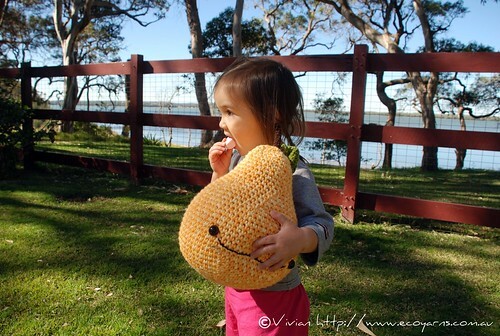 She posed happily with Mami pear while having a mouthful of marshmallow. She is so precious! 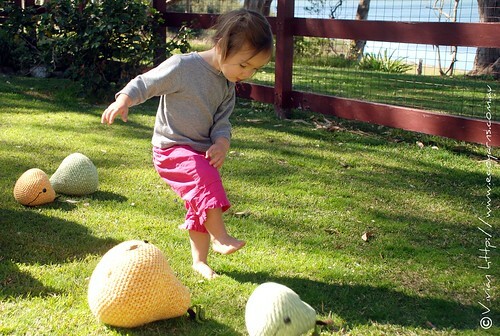 Ysoline signals the end of the photo shoot by kicking the Amigurumi Pears away and running off in the opposite direction! 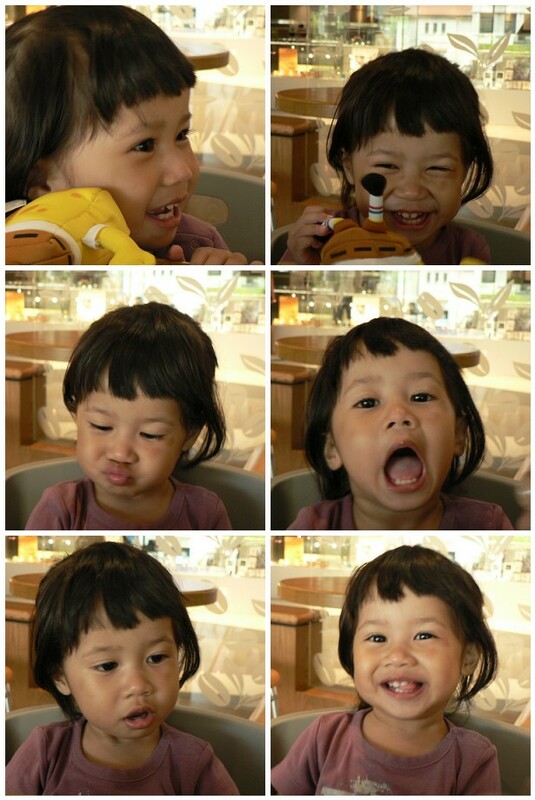 Hehehe… Too cute! P.S. 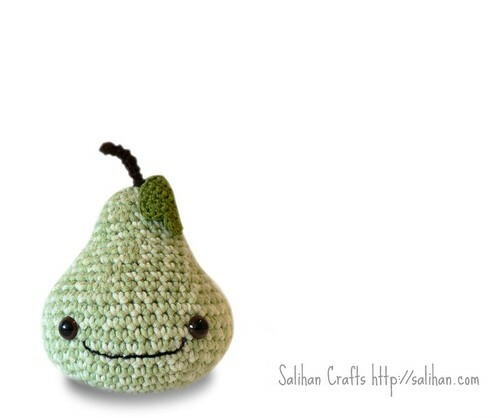 The Amigurumi Pear giveaway is still on and open to everyone. Leave a comment to win a pear of your choice. CLICK HERE to enter. I will ship internationally. P.P.S. 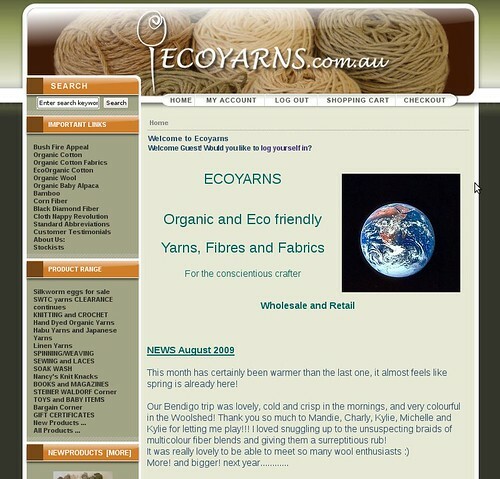 Check out Ecoyarns for a huge range of eco friendly knitting yarn, spinning fiber and much more! Do you remember the yarn stash explosion and how I’m knitting Rosemary a Wisp shawl? Well, it didn’t turn out quite as planned. 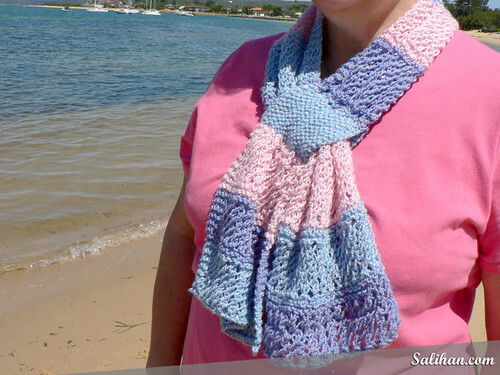 The “shawl” was more like a wide scarf and since it was knitted in acrylic, I couldn’t block it to make it wider. I could have kept knitting and just gave her a normal scarf but I don’t think she would like it. I’ve never seen her wear a scarf but she wore a Fourteen neckwarmer last year. She likes the cold and doesn’t like anything fussy around her neck. So I had to come up with an alternative very quickly. I was going to see her the next day! 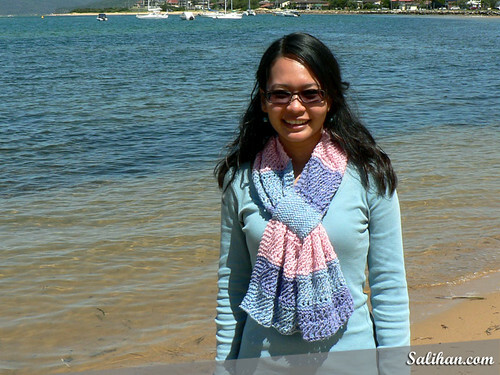 Coincidentally, Oiyi blogged about the bow-knot scarves she’s made and I had an AHA moment. Bow-knot Wisp! Instead of having a ribbed “knot”, I knitted it in a moss stitch. I was still anxious about giving the knitted scarf to her. What if she hates it? “There’s nothing more you can do now”, I consoled myself. 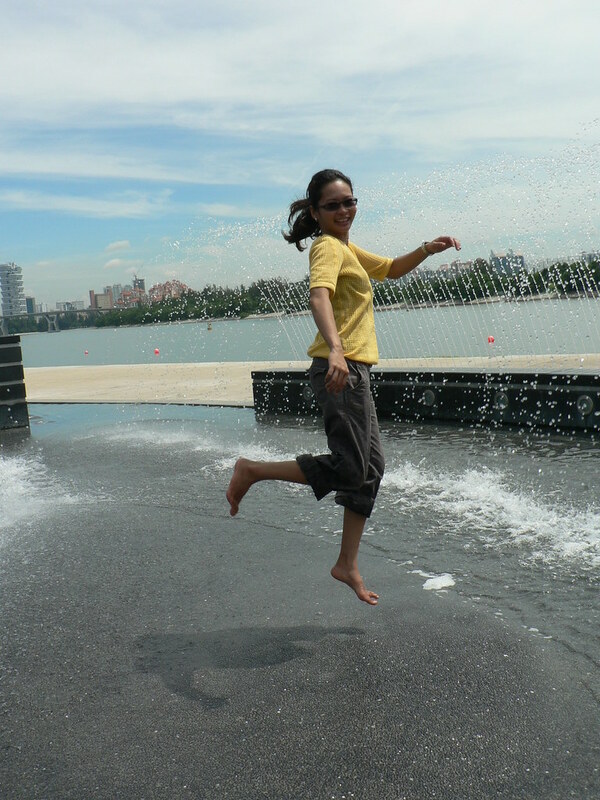 She came over the next day in a bright pink top and her purple watch. So far, I was spot on with the colours she normally wears. I gave her the scarf and she wasn’t too sure about it. 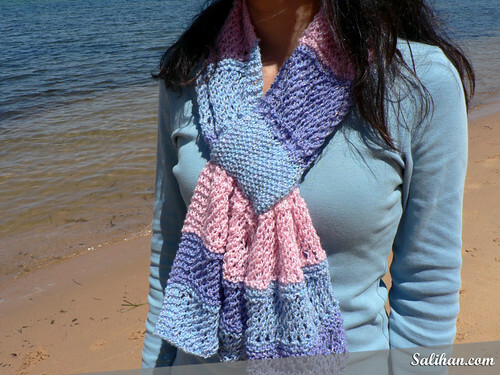 She smiled and thanked me, saying the scarf is pretty. The uncertainty was still there. We went to the beach after lunch and she agreed to let me take photos of her wearing it. It was such a beautiful Autumn day and the metallic threads in the lacy scarf caught the sunlight and sparkled. Rosemary volunteered to take photos of me wearing the scarf. The scarf matched both our tops beautifully. She looked carefully at the Bow-knot Wisp around my neck. “It’s pretty”, she said, “now that I can see it better”. “It’s sparkly too”, she went on. You cannot imagine how relieved I felt when she said all that. She also appreciated that the scarf stays put and doesn’t move around like a regular scarf. Phew! 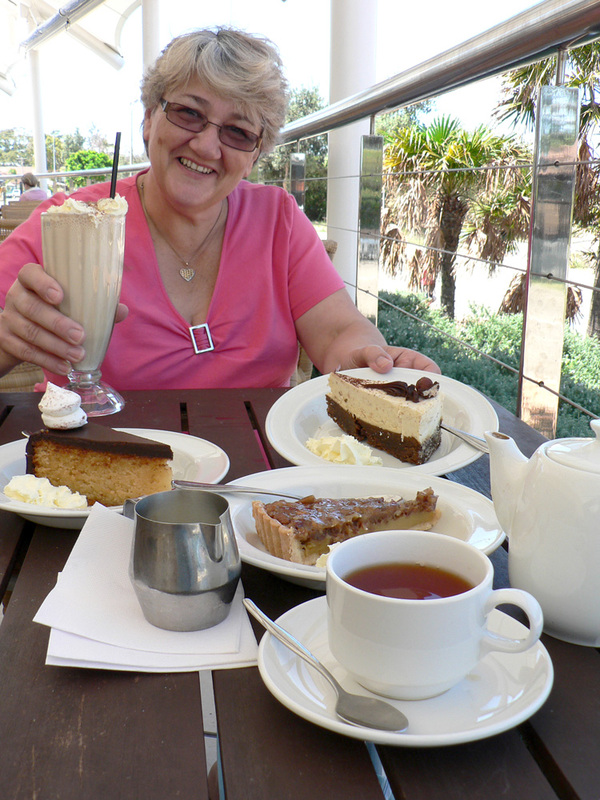 We went to the club after the photo taking, where she treated me to cakes and tea. Let me be more specific. She shouted me THREE slices of cake! I protested but she insisted that the two of us can easily finish THREE slices of cake. Nope. I could only finish two halves. Haha… Boy, were we full after that! 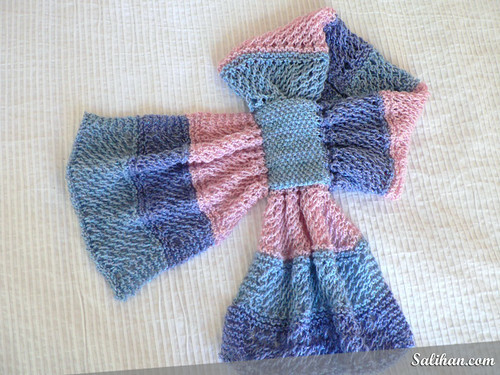 In my next blog post, I will write up the knitting pattern for the Bow-knot Wisp. Have a lovely week and I’ll see you soon! We went to Simon and Meg’s for dinner last night. Kyle and Linda brought their cute baby son, Ewan, along and I had lots of fun photographing him. He just kept staring into the camera when I pointed it at him! 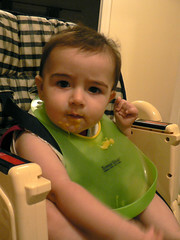 But it still wasn’t easy capturing a bouncing baby boy! 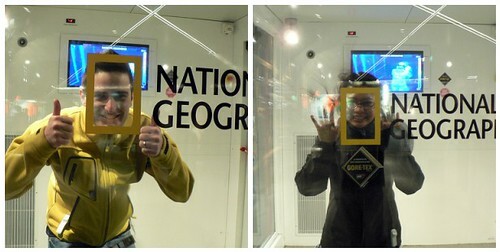 I’m a tinge disappointed at how the photos turned out. The Panasonic Lumix camera is crap at low light. 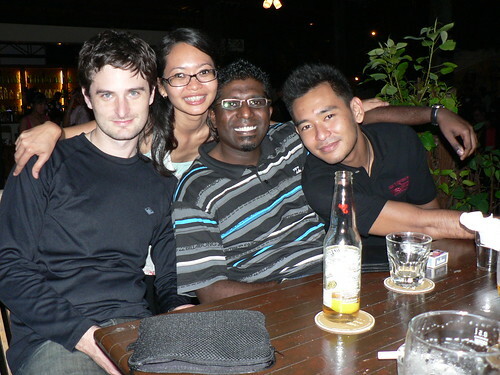 I hate using the flash but I just have to put my pride aside from now on and use the flash more often indoors. I’d rather capture the shot then worry about colours! Warning! 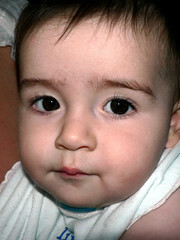 Cute baby photos ahead! P.S. Dinner was very nice, Simon, especially the panna cotta.